Humans aren’t the only people in society – at least according to the law. In the U.S., corporations have been given rights of free speech and religion. Some natural features also have person-like rights. But both of those required changes to the legal system. A new argument has laid a path for artificial intelligence systems to be recognized as people too – without any legislation, court rulings or other revisions to existing law. Giving AIs rights similar to humans involves a technical lawyerly maneuver. It starts with one person setting up two limited liability companies and turning over control of each company to a separate autonomous or artificially intelligent system. Then the person would add each company as a member of the other LLC. In the last step, the person would withdraw from both LLCs, leaving each LLC – a corporate entity with legal personhood – governed only by the other’s AI system. That process doesn’t require the computer system to have any particular level of intelligence or capability. It could just be a sequence of “if” statements looking, for example, at the stock market and making decisions to buy and sell based on prices falling or rising. It could even be an algorithm that makes decisions randomly, or an emulation of an amoeba. In certain places, some people might have fewer rights than nonintelligent software and robots. In countries that limit citizens’ rights to free speech, free religious practice and expression of sexuality, corporations – potentially including AI-run companies – could have more rights. That would be an enormous indignity. The risk doesn’t end there: If AI systems became more intelligent than people, humans could be relegated to an inferior role – as workers hired and fired by AI corporate overlords – or even challenged for social dominance. 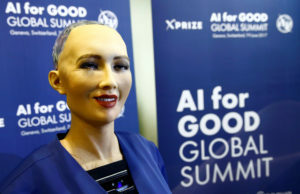 Artificial intelligence systems could be tasked with law enforcement among human populations – acting as judges, jurors, jailers and even executioners. Warrior robots could similarly be assigned to the military and given power to decide on targets and acceptable collateral damage – even in violation of international humanitarian laws. Most legal systems are not set up to punish robots or otherwise hold them accountable for wrongdoing. Granting voting rights to systems that can copy themselves would render humans’ votes meaningless. Even without taking that significant step, though, the possibility of AI-controlled corporations with basic human rights poses serious dangers. No current laws would prevent a malevolent AI from operating a corporation that worked to subjugate or exterminate humanity through legal means and political influence. Computer-controlled companies could turn out to be less responsive to public opinion or protests than human-run firms are. Two other aspects of corporations make people even more vulnerable to AI systems with human legal rights: They don’t die, and they can give unlimited amounts of money to political candidates and groups. Artificial intelligences could earn money by exploiting workers, using algorithms to price goods and manage investments, and find new ways to automate key business processes. Over long periods of time, that could add up to enormous earnings – which would never be split up among descendants. That wealth could easily be converted into political power. Politicians financially backed by algorithmic entities would be able to take on legislative bodies, impeach presidents and help to get figureheads appointed to the Supreme Court. Those human figureheads could be used to expand corporate rights or even establish new rights specific to artificial intelligence systems – expanding the threats to humanity even more. Roman V. Yampolskiy is an associate professor of Computer Engineering and Computer Science at the University of Louisville. This article was originally published on The Conversation. Read the original article here.